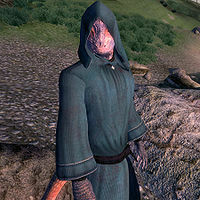 Tooth-in-the-Sea is an Argonian mage and the master Alteration trainer. As the advanced-level trainers will tell you, he lives, as his name implies, in the sea. You can find his night camp on the coast north of Bravil, directly east of Flooded Mine. Every day, when he wakes up at 6am, he heads straight east into Niben Bay, dives down and spends the next twelve hours under water. He surfaces at 6pm and walks directly up to the camp, lights his campfire to dry up and lies down on his sleeping mat, without having eaten, for twelve hours of sleep. He will only offer training when he's awake. He wears the standard mage's robe along with a matching hood and carries a leveled amount of gold. He knows a standard set of mage spells. When you have received the necessary references to approach Tooth-in-the-Sea for master training, he will put your water breathing abilities to the test: "Would you learn from me? Then meet me during the day, out under the waves in the bay." and afterwards: "We will not speak of training here. When I have settled myself in my favorite spot in the bay, then we shall talk. Follow me there, if you wish." If you try to begin the test after 1pm, Tooth-in-the-Sea will tell you: "It is too late in the day to begin your test now. Return tomorrow before 1 PM, and we shall discuss it then." Once you speak to him underwater, he will say: "Well, here we are. If you wish to learn what I know about Alteration, then you must stay here with me for a full three hours. How you manage to do this is up to you; do not wander off, or I shall consider this test of your ability failed. Are you prepared to begin now?" 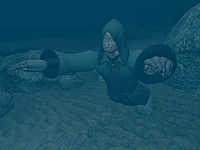 After three long hours under water, he will be the one approaching you: "You have passed your test. Well done. I shall be more than happy to train you in the skill of Alteration from now on." If you are an Argonian, he will not require you to do the test. Instead he will say: "A fellow Argonian. How good to see. Were you anyone else, I would require a test before offering you training, but it's one I'm sure you could pass." He will then say: "I am at your service. If you need Alteration training, I am here for you." His fame as an Alteration trainer has spread across Cyrodiil. Abhuki will tell you: "Tooth-in-the-Sea can teach you more than I. Search for him north of Bravil, along the coast of Niben Bay. Or perhaps in it, depending on his mood." while Athragar comments: "If you wish to learn more about Alteration, you'd be wise to consult Tooth-in-the-Sea. If you can find him, that is. I believe he's currently residing somewhere north of Bravil. Spends most of his time in Niben Bay, I understand. And I do mean IN Niben Bay." When asked about master training again, either trainer will provide you with a quick reminder: "Seek out Tooth-in-the-Sea. He can train you further." Esta página foi modificada pela última vez à(s) 20h21min de 6 de janeiro de 2015.